A few months ago, someone asked me if I had a recipe for a vegetarian version of Chicken and Dumplings. There are a lot of dishes on my mental list of things to make meatless, but that’s one that I never really thought about, mostly because I’ve never had Chicken and Dumplings before. I forgot about it for a while, then I happened to see a Chicken and Dumplings recipe on Martha Stewart’s website and thought maybe I’d give this whole Chicken and Dumplings thing a try. Minus the chicken, of course. The big honkin’ question when you’re making a meat-based recipe meatless is, “What will I replace the meat with?” I thought about using seitan, but I decided to go with chickpeas because I remembered that Thrifty Veggie Mama had used them in a vegetarian Chicken and Dumplings recipe too and chickpeas are more readily available than seitan. So we have dealt with the main obstacle! Chris and I aren’t fans of peas, so I took those out and added a parsnip and red potatoes instead. 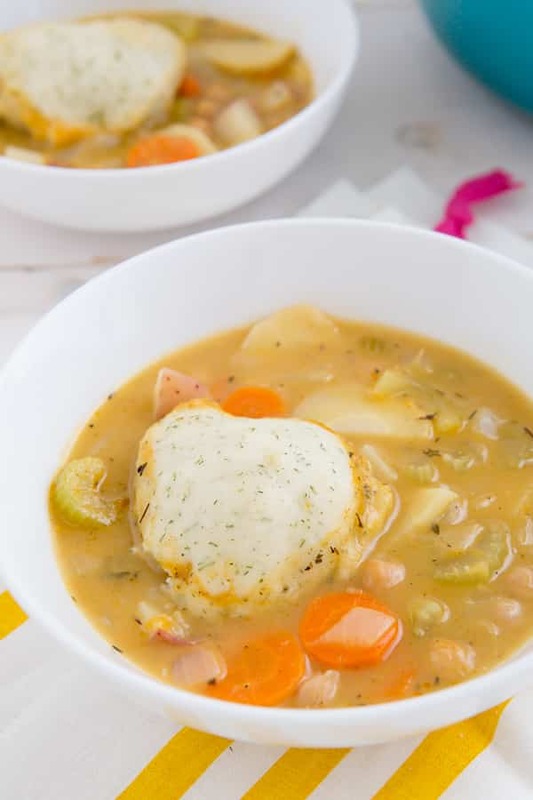 The chickpea-and-veggie stew is prepared in a big Dutch oven and once it comes to a boil, you drop spoonfuls of dumpling batter onto the top. When you put the lid on the Dutch oven, the dumplings will steam in the pot; 20 minutes later, your veggies are tender, your dumplings are firm and puffy, and you have a big pot of comfort food to keep you warm and full. A meatless version of Chicken and Dumplings, inspired by Thrifty Veggie Mama and Saveur, and adapted from Martha Stewart. Melt the butter in a large Dutch oven over medium heat. Add the onion, garlic, carrots, parsnip, potatoes, celery, thyme, and bay leaves. Cook, stirring occasionally, until the onions are translucent, 5-8 minutes. While the veggies are cooking, whisk together 3/4 cup flour, baking powder, salt, and dill in a medium bowl. Use a fork to gradually stir in 1/2 cup of milk. The batter should be slightly thicker than pancake batter and drop easily from a spoon; if it's too thick, add the additional milk 1 tablespoon at a time. Set aside. Sprinkle the remaining flour over the veggies and stir to coat; cook for 30 seconds. Pour in the white wine and cook until evaporated, about 2 minutes. Add the broth, chickpeas, paprika and salt and pepper to the Dutch oven; bring to a slow boil, stirring occasionally, then reduce the heat to low. Drop the dumpling batter into the pot in heaping tablespoonfuls. You should have enough batter for 8-10 dumplings--be sure to keep them evenly spaced because they'll expand as they cook! Cover the Dutch oven and simmer for 20 minutes, or until the potatoes are tender and the dumplings are firm. Remove the bay leaves before serving and season with additional salt and pepper, if needed. This post was originally published on February 12, 2014. Oh wow. the kids (& I) are going to LOVE this for lunch at the weekend! – Thanks for sharing! This was so delicious!!! Thank you do much for sharing! I ended up subbing more brith for the wine and it was great! Thanks again! GREAT recipe! I’m kind of obsessed…. This recipe looks so delicious? I do not have a Dutch oven though. 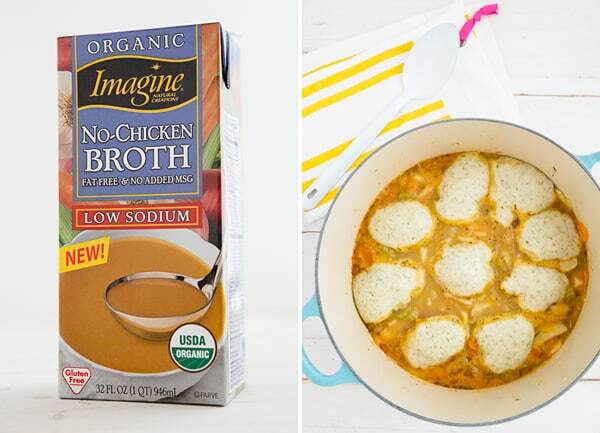 Can I make this in a crockpot or large soup pot? Instead of chickpeas I used the Beyond Meat brand chicken strips. I just shredded them up and added them in right before the dumplings. I omitted the wine, parsnips and the veggie broth. I completely forgot to add my “better than bouillon” and just added water! And I added mushrooms. I think this is one of the best things I’ve ever made! Even though I left out the broth it was still seasoned really well, not at all bland. It was so good and the dumplings were way simpler than I thought! I am going to be making this again for sure! This is such a good recipe. I have made it several times for my family who would prefer a meal contains meat. They love this dish. I love that is inexpensive to make. The flavor is surprisingly complex. I think it is because good fundamentals of cooking. Great work. Thanks for sharing. I made this a few months ago and LOVED it. My dumplings turned out perfect. The last time I tried dumplings they came out as golf balls. Im making it tonight because I had white wine in the fridge and instead of using onions I used leeks I had in the fridge which were going to no use as well. Im hoping it comes out just as yummy. Its cooking at the moment and Im at the edge of my seat hoping its as good as the last time! Im so used to trying internet recipes and being unhappy with the results, this was a 10/10. Smells good so far! I just wondered what the calorie count on this recipe is? Is it listed somewhere and I’m missing it? Yum! We modified for vegan with almond milk in the dumplings. This really hit the spot on a rainy day. I am making this for my supper tonight and was wondering if the can of chickpeas is drained and rinsed? Hi Nicole! We’ll be sure to try this out sometime! Made this last night. It was excellent!! Thanks for the recipe. I used gluten free flour and almond milk for the dumplings and they turned out great! This recipe is super delicious! Even after I doubled the recipe the last time, it wasn’t enough to satisfy my hunger for it. Along with some of the other folks, I used gluten free flower and almond milk for the dumplings. Worked great. Thanks for sharing! I made this for dinner last night (have made it before too) and my husband brought the leftovers for lunch today. He just texted me that “Chickpea dumplings are the best.” Thanks so much for this great recipe. It makes me happy to cook dishes like this that I know are healthy and delicious!